Having a large animal jump into your path while speeding at over 100 kilometers per hour is a fear many people in Saskatchewan share. But learning, and practicing, a few simple precautions can mean the difference between major accident and a close call when encountering wildlife out on prairie roads. Photo credit: Flickr/Enroch Ross. Two young moose seen here crossing a highway in Ontario. 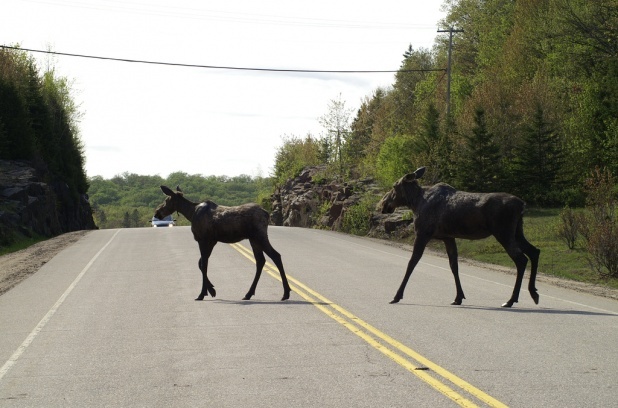 SGI reported nearly 16,000 claims made in 2011 that were the result of collisions with wildlife. Out of those 304 involved injuries and 2 were fatal. The highest number of claims are made during October and November, but SGI says that precautions are necessary year-round. These are numbers that SGI, along with the Saskatchewan Wildlife Federation and the Saskatchewan Government say can be reduced with a little diligence from drivers. Animal activity is at a daily peak during dawn and dusk, and this is when you should be on your most alert while driving. Rebecca Rogoschewsky, Manager of Media Relations for SGI says, says paying attention to road signs is vitally important. SGI also recommends that drivers remain alert while at the wheel and scan the road from side to side to ensure that they know what is headed in their direction. Remain calm. If you have time to stop, do so safely. Remember that often, where there is one animal, there is usually more. You can also sound your horn to scare wildlife away from the road. If an animal appears suddenly and surprises you, remember to brake firmly and stay in control of your vehicle. Avoid swerving because you may turn into oncoming traffic or roll into the ditch. Let up on your brake just before you hit the animal. This will raise the front of your vehicle and can reduce the risk of the animal going through your windshield.